Spring is on its way and the busy season is right on its heels. Before you know it, there will be fewer opportunities to plan and schedule a deep spring cleaning. We’re sure you make a point to carefully clean every visible corner of your home when guests check out but we also suspect there are a few places that don’t get the same kind of consistent attention. Is your place ready for the season ramp-up? 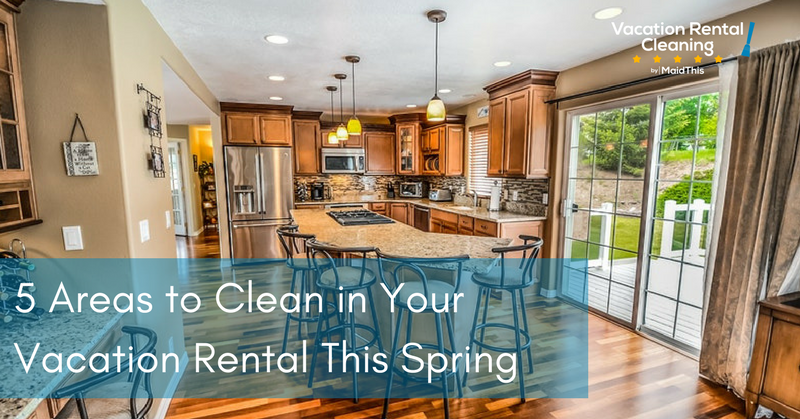 Here are 5 areas to clean in your vacation rental this spring before things get busy. 1. Inside kitchen and bathroom drawers. Your bathroom drawers may be fairly easy to open and spot dust, especially because they’re most likely to be empty. Kitchen drawers, however, are more likely to have gadgets and cooking tools taking up space and hiding crumbs. Make a habit of removing all the items from the drawer once a year and using a damp cloth to trap and remove debris from the bottom and corners of drawers. Don’t stop with the kitchen and bathroom – check all the drawers throughout your rental. 2. Under large area rugs. Your cleaning team makes a habit of vacuuming your large area rugs to remove dust but do they get under the rug to catch dust that’s collected below? If your rug hasn’t been moved in a while, roll it up and give the bare floor a good run over with a vacuum or damp mop if your rug is covering a tiled or wood floor. It’s not a bad idea to do this quarterly to avoid a significant buildup of allergens and dirt. When was the last time your oven, refrigerator, and washer and dryer were pulled away from the wall? If you’re like most homeowners and vacation rental hosts, we’re going to guess it’s been a while. It’s common for bugs to take up residence and expire behind these fixtures. Though you may not have a “problem” with pests and though your guests don’t see them, they’re still not houseguests you want hanging around. Ask your cleaning team to make a point to pull out your appliances and clean behind them. A quick sweep with a vacuum hose or duster should do the trick. 4. Inside the dryer vent. If you offer your guests the ability to do their laundry, be sure to stay on top of this additional set of machines. Even the most carefully maintained dryers can suffer from lint buildup, especially in the vent. This can not only cause your dryer to have issues but it can be a fire hazard. If you’re not willing to clean out your own dryer vent and hose on your own, hire a professional HVAC company to do it. Alternatively, dryer hoses are relatively inexpensive; you can simply replace the entire hose altogether. When was the last time you wiped down the shelves in your linen closets or pantry? These areas may not get much attention due to their usually being bare, but that doesn’t stop them from collecting dust. Ask your cleaning team to quickly run a dusting wipe over them to trap loose dust that has settled over the course of the year. While you’re at it, check your kitchen cabinet shelves, too. Leave no spot undusted! Don’t wait to get these things marked off your cleaning list. Though they’re important, take solace in knowing that you won’t need to revisit these anytime soon. Feeling overwhelmed by adding these items to your cleaning list? Let MaidThis! handle your turnover cleanings for you! We’ll get you set up and ready for your next check-in in no time.